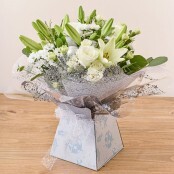 Now taking orders for MOTHER'S day (31st March). Don't delay, order today. PLEASE NOTE We have now moved premises to 10 FARNDON ROAD, WOODFORD HALSE NN11 3TT. All other contact details reman the same. We are an established florist shop with an enviable reputation for high quality and excellent personal service. Based in Woodford Halse we are ideally situated in the rural 'gap' between Banbury and Daventry where many florists will charge a lot for delivery - we currently offer a minimal delivery charge for orders placed online. We offer bespoke designs to suit individual tastes from traditional to contemporary, muted to colourful, simple to sophisticated. No two designs are the same but all are guaranteed to deliver a smile (or tears) and a warm feeling. Browse through our pages to choose your flowers or call 01327 262336 to discuss your requirements with one of our friendly members of staff. If you are planning a wedding, why not book a free, no-obligation, consultation? We also offer free home consultations for people arranging funerals. Click HERE to request a consultation or call us. Visit our Facebook page for some more information. Please contact us on ali@theblossomshop.co.uk with any questions you may have.